Homework is an important part of the student’s education and establishes a daily link between home and school. In this way, homework helps provide parents with an opportunity to be involved in the curriculum on a regular basis. For the student, it offers an opportunity to practice skills, review information learned in class, prepare for upcoming topics and tests, and to develop self-discipline and responsibility. Homework helps teachers in the evaluation of class and individual student progress. Suggested time allotments for homework are generally to take the grade level and multiply it by ten. For example, a seventh grade student should be doing about 70 minutes of homework per night, on average. Written homework is collected and inspected by the teacher and then returned to the student. The teacher will contact the parents of students who consistently fail to turn in assigned homework. In the junior high, detention will be assigned for refusal to comply. Detention is not a substitute for completing the work and it is expected that the missing assignment(s) will be handed in to the teacher. Teachers are not required to provide homework or advance lesson plans to students going on family trips. Parents must call the office by 9:30 to arrange for homework for a student who is absent. Student Evaluation Reports, or report cards, are issued three times a year on a trimester basis (December, March, and June). These issue dates can be found in the school calendar. The report cards are passed out in school and carried home by the students. They should be signed by the parents or legal guardians and returned to school by the student. Upon accepting a student, the school accepts the responsibility of educating that that child. It is expected that the performance of each child will be directed toward maximizing the individual’s abilities and talents. 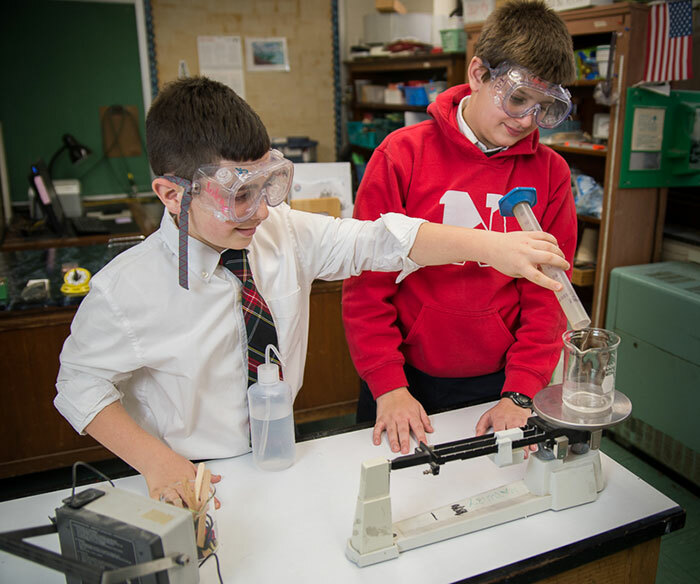 The uniqueness and individual differences of each student are strong beliefs in the value system of Catholic schools and every effort is made to meet the varying needs among our students within the limits of local resources. Successful achievement of required passing average. At the end of each marking period, student achievement in grades 3-8 is recognized through honor roll and merit roll lists and awards. In the junior high, mid-trimester progress reports are sent home to parents 3 times during the school year, between report cards, or at any point deemed necessary by the classroom teacher. The reports are designed to allow the teacher to note improved as well as deficient progress on the part of the student. This allows for ample time to make adjustments that will better help the student achieve academically. Teachers will not usually send progress reports to students who are achieving on a satisfactory level. For the first two trimesters in the sixth grade, all students are issued mid-trimester progress reports. This is done to assist students with the adjustment to a departmentalized junior high.